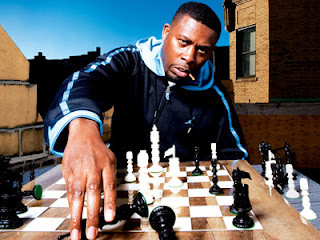 Astrophysicist and generally good-natured eloquent guy Neil deGrasse Tyson had co-founder of the Wu-Tang Clan and generally brilliant guy Gza/Genius as a guest on his radio/TV show recently. Somehow, Tyson was not quite aware of the massive cultural influence Wu-Tang, especially Gza, has had on the world. Here he learns, much to his amazement, how young listeners of Wu music were consequently led to passionate interests in science. Watching him get schooled by The Gza, who spun out a few eye-opening bars during the convo, makes for great entertainment. And if you happen to be someone who is not fully aware of how Wu-Tang has inspired two decades worth of young people to seek Knowledge, Wisdom, and Understanding, you'd gain a fresh perspective by checking out the show. There's a lot of good stuff there, but the highlight for me was the reaction when Tyson read a comment from a high school science teacher who was led toward a passion for physics by the music of the Wu-Tang Clan. I can speak from experience: the Wu does indeed pack a powerful influence. My first encounter with Wu-Tang was as an 11-year-old coming home from school and watching TV with my brother. The cinematic video for their song "Triumph" (arguably their greatest song ever and the apotheosis of the group) dominated MTV at that point and the massive collective of colorful comicbook personalities quickly became hometown heroes for us. My interest in their music and mythology grew rapidly from there. I don't have many regrets in life, but I can think of one little thing that sticks with me. In late 2007, during my final year living at home in Staten Island, Wu-Tang Clan was preparing to release their first group album in over 6 years and New York City was abuzz. One day my mom brought me a section of the Staten Island newspaper which had a request for submissions. They wanted people to send in essays reflecting on what Wu-Tang has meant to them. With much excitement, I began drafting notes for an epic submission on how Wu-Tang had led me to a passionate interest in studying comparative religion, mythology, physics, psychology, etc, etc, all these things that I didn't learn in school but could discuss knowledgeably thanks to the Wu's heavy lyrics kindling a passionate curiosity and steering me toward autodidacticism. I had so much to say, too much, and never polished off the completed piece before the deadline, losing my chance to have it published in the Staten Island Advance. Huge regret. Five years later, I can sum up the power of Wu-Tang's influence on me like this: I just finished reading Finnegans Wake (considered the most difficult book in the English language), I've read Ulysses multiple times and managed to find myself delivering a lecture on James Joyce at Caltech last year, and I never even took a college literature class. While it was Joseph Campbell who put me on to the scientificophilosophical mystic poeticism of Joyce, it was Wu-Tang (The Rza, particularly) who led me, via an interest in Eastern religions, to study Joseph Campbell. It was Wu-Tang who first made me realize that reading books, having knowledge, playing chess, etc was cool, was worthwhile, and that earth-moving impact continues to be the foundation I build upon. So there.